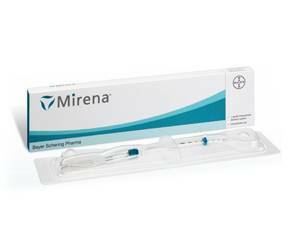 Mirena is a prescription-only intrauterine delivery (IUD) system progestogen contraceptive. Mirena is a reversible levonorgestrel-releasing contraceptive that works by changing the lining of the uterus, altering cervical mucus and making it difficult for sperm to enter the uterus. It is particularly helpful for women with idiopathic menorrhagia (heavy menstrual flow) and can also protect against endometrial hyperplasia during oestrogen replacement therapy in postmenopausal women. Mirena is inserted in the uterine cavity of women of a fertile age, within seven days of the onset of menstruation. Women using Mirena should be encouraged to give up smoking. Mirena contains levonorgestrel 52 milligrams and releases approximately 20 micrograms each day. Mirena should only be inserted by a healthcare professional. Mirena is contraindicated in women with impaired liver function or various cervical/uterine conditions. Mirena should be used with caution in postmenopausal women with advanced uterine atrophy and although it can be used in diabetics, it is important that blood sugar levels are carefully monitored. Mirena should not be used in women who are pregnant. There are no known effects of Mirena on driving ability.